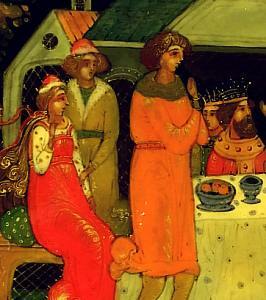 The King, his guests, the Princes and Princesses - all are watching in awe the newly discovered wife of Prince Ivan. Having only ever shown herself in the form of a frog, Vasilisa the Wise turned out to be a beautiful princess who, among other things, can make lakes and swans appear by simply waving her sleeves. Ivan stands thunderstruck: will he be able to resist the temptation to burn the frog skin of his wife in order for her to always remain the way he wants to see her - in the form of a beautiful princess? The painting has a pleasant balance of bright orange and scarlet with more subdued, earthy shades of murky green, teal, blue, and brown. The white swans in the forefront of the painting add a delicate touch to this already elegant painting. The composition is adorned with a gold and silver ornament, and a more elaborate gold and silver ornament decorates the sides of the box. This lovely work is painted on a papier mache box. The box sits flat with no legs, and opens without a hinge. The interior is traditional red lacquer. The composition is signed at the bottom with the name of the artist, village, and year. "Made in USSR" is inscribed on the bottom of the box. Box and lacquer are in very good condition.